If you tuned in to internet broadcast of the Daytime Emmy’s, then you already know that The Young and the Restless bagged 6 different major awards, including Best Drama Series and Best Lead Actor. That sounds pretty impressive, but you have to remember that it’s based on last year’s work. The last 6 months on the CBS sound stage have been hellish for anyone involved with the long running daytime drama and all roads to the misery seem to lead back to one person — Jill Farren Phelps, Y&R’s show runner. Phelps has a history of being brought in to save shows that are struggling and ultimately she seems to have a Dr. Death effect. Santa Barbra, Another World, Guiding Light — each one of these now-defunct shows featured story lines that victimized women and writing that shocked the hell out of longtime viewers. Phelps inevitably won awards for her special brand of story telling and then almost immediately ended up fired as the networks scrambled to save each of these shows, to no avail. It seems that once Phelps is involved it’s the beginning of character assassinations galore and the slow death of long running shows as the fans’ collectively quit watching. That is exactly where Y&R is at; the fans have scattered because Phelps has ruined favorite characters and those are the lucky ones — because at least they are still chewing scenery in Genoa City. A multitude of favorite actors like Billy Miller, Michelle Stafford, Genie Francis have been fired on the spot simply because Phelps enjoys her power trips a little too much. The situation with Michael Muhney is another glaring example of Phelps’ ineptness. When younger actress Hunter King allegedly accused Muhney of sexually groping her twice it wasn’t Phelps’ instinct to protect the actress. Instead, she saved her storyline and kept Muhney around for three more months! IF King’s claims were legit, then in any other industry Muhney would have been fired immediately. Why is it that CBS has never had an issue with how badly Phelps handled the whole situation? Is it because by making her accountable it would have called more attention to the original claims? Or is it that the claims held little water and that is why Phelps dragged her feet in taking action? Sure, it gave her an excuse to get rid of Muhney — in her own good time, which is probably what she wanted to do anyway. 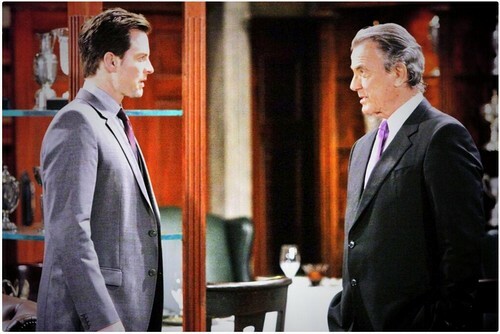 The situation with Muhney has cost Y&R hundreds of thousands of viewers. Either the fans needed proof of something or else they need an apology for how badly one of (arguably) the best actors in daytime was treated. The fact that 6 months later neither of these things has happened has only led to an even bigger mass exodus of fans. Clearly, Phelps has not improved the quality either onscreen or behind the scenes at Y&R. And it’s time for her to leave. Even if Y&R gets smart and cans Phelps tomorrow, it doesn’t mean that a new show runner can save the show. Just ask former Another World, Guiding Light, and Santa Barbara fans what an uphill battle that task has proven to be! Is it time for CBS to get rid of Phelps? Even if they do it, can Y&R be revived or is it already too far gone? Tell us your thoughts in the comments below!